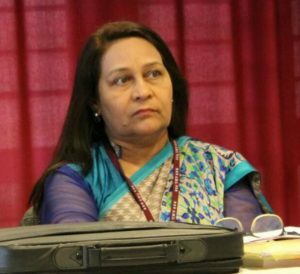 Dr. Samina Khan is Professor at the Department of English at Aligarh Muslim University, Aligarh, India. Her areas of interest and research include comparative literature, Performance Studies, Prison Literature, Human Rights, Gender Issues and Communication Skills. Dr. Khan holds many posts like Editor of magazine, Manager of School, Academic Advisor, Member of Research Committee, and Human Activist, Vice President of PUCL, Nodal Teacher of Gender Champion Scheme, Member of Internal Complaints Committee AMU, Alumni affairs Committee of AMU and more. She is pro-active in the field of Gender justice issues. She is a regular participant and invited speaker in various opinion polls and interactions on social/academic/national issues in print and electronic media. She is also associated with FITS (FSLE-India Theatre Society).